APA President Jeffrey Lieberman, M.D., is using the Psychiatric News Alert as a forum to reach APA members and other readers. Please send your comments to pnupdate@psych.org. 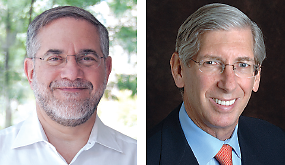 This column was written by Steven Hyman, M.D., and Dr. Lieberman. The first two articles in this series addressed the prospect of change in psychiatric medicine and mental health care and the anticipated effects, in this regard, of health care reform. In this article we discuss the current status of biomedical research and how it will impact our field and practice. The research enterprise has brought clinical psychiatry to an exciting but treacherous juncture. Based on remarkable new tools and technologies in genetics and neuroscience, there has been an explosion of new knowledge about the etiology and neural underpinnings of schizophrenia, bipolar disorder, Alzheimer’s disease, autism, addictions, and other serious conditions. Indeed, the fields of psychiatric medicine and mental health care are poised on the brink of transformative advances in diagnostic methods and therapeutic modalities. However, just at the time when biomedical research is gaining significant traction and momentum in understanding the brain and mental disorders, support for all research, and most importantly biomedical research funded by the National Institutes of Health, is painfully contracting, the result of congressionally driven budget cuts. Just as scientific opportunity in our field is waxing, the ability to exploit it is waning. The recent budget sequestration has had a huge negative effect, but is part of a larger pattern of what has been eroding the support for research in the United States. The decline in research funding affects all of medicine, but psychiatry faces a special problem. Since 2010, the pharmaceutical industry has substantially retreated from research on psychiatric disorders despite years of commercial success with antidepressants and antipsychotic drugs. To read more, including advances in genetics and stem-cell research, click here.